At one time, if asked to make a list of their car wash cleaning equipment, most would have responded with items like buckets, sponges, squeegees, chamois leathers, buckets and hoses. Today, a growing number of vehicle owners are likely to produce a list of just two items; a chamois or soft cloth and a high pressure washer. A shampoo with added wax may well take a lot of the time and effort out of restoring your vehicle’s shine but even this will be a wasted effort if, before it is applied, the surface of your car is not thoroughly clean and free of grit and dirt that, otherwise, may lead to severe scratching of your paintwork. The garden hose may be of some help if your mains water pressure happens to be reasonable but, where the build-up of dirt is heavy and in those out of the way places like the wheel arches, it is unlikely to be effective and will almost certainly need a bit of sponging to help matters along and even this is quite likely to cause scratches. For many, of course, the task of sprucing up the family motor is delegated to the local carwash. Here to, there has been a shift away from the more labour-intensive cleaning practices of the past with all of the preliminary cleaning, shampooing, rinsing and sometimes drying being provided by means of these pressure washers. The outlet may use individual units or centralised compressors that provide the pressure needed to operate several hoses and that are able to introduce a wax shampoo into the cold water jet when required. More sophisticated systems may employ a mobile gantry system that makes several passes over the vehicle to perform each stage of the cleaning process in sequence. When the time comes for attention to the interior, steam extraction cleaners leave upholstery hygienically clean, and dry and a quick wipe over of the dashboard is all that remains. 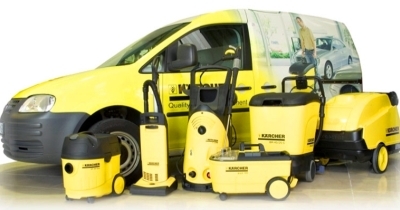 Kärcher offers a full range of quality car wash cleaning equipment for home, commercial and industrial use. If you’re setting up a car wash, cleaning equipment will be high on your list of purchases. The precise need will vary with the expected throughput of the operation but will consist of units for washing the exterior surfaces of the car and smartening up the interior. The starting point must be a suitable high pressure cleaner. In its simplest form this may be a portable unit with a water tank of suitable size; small for minimal traffic but larger for a busier facility. The larger tank prevents the need to refill it too often and so speeds up the service. This type of cleaner normally works fine with cold water since modern detergents are highly efficient, making operating costs lower. Hot water and higher pressure models are available if your client-base is likely to include a lot of off-road vehicles, bakkies, trucks and the like but you will need to charge a little more for your services. Fixed installations of pressure cleaners with centralised compression will require specially constructed premises but are ideal for busier operations. When considering how to tackle vehicle interiors, the industry offers some alternatives. You can choose from conventional high power, high-capacity vacuum cleaners or equally powerful spray extraction cleaners. The perfect solution is definitely to combine the use of the basic vacuum cleaner with that of a spray extraction unit, often referred to as a steam cleaner. The former is ideal for picking up sand, grit and other visible detritus from all of the interior surfaces. The extractor’s spray penetrates deeply into the pile of the carpets and upholstery, after which the dissolved dirt is then sucked clear immediately. The result is that these fabrics are left deep-cleansed and perfectly dry in all weathers. Since clients are often in a hurry and may be deterred by long waits, this could be the perfect tool with which to improve throughput and turnover. Clearly, the correct choice of car wash cleaning equipment will be of vital importance to the success of your business, so consult the experts at ITS Africa.